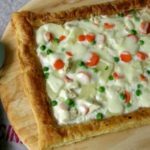 A twist on classic pot pie - pizza with a puff pastry crust, white sauce, turkey, vegetables, and sliced mozzarella cheese. Cut the turkey into bite-sized pieces and set aside. Peel the potato and carrot and cut into bite-sized pieces (about 1/4-inch thick). In a sauce pan, add the broth/stock, potato slices, and carrot slices. Bring to a boil and then lower the heat and cook until softened, about 15 minutes. Transfer the potatoes and carrots from the stock into a bowl. Add the peas to the stock and cook for a couple of minutes. Drain peas and add to the bowl with potatoes and carrots. In a small skillet, add the olive oil and onions and cook over medium heat until onions are soft and translucent. Remove from heat and set aside. Thinly slice the mozzarella and set aside. In a small saucepan over medium heat, melt the butter and then add the flour. Stir and cook for 1 to 2 minutes. Whisk in the milk a little at a time. Continue cooking, stirring constantly, until mixture comes to a boil and thickens. Remove from heat. Add salt and pepper to taste. Preheat the oven to 400 degrees F. Lightly grease a baking sheet. Place the puff pastry on the baking sheet and roll it out to about a 10 X 15-inch rectangle. Using a fork, pierce the entire pastry except about 1/2-inch from the edge. Bake for 15 to 20 minutes or until puffed and lightly browned. Use a spoon or knife to partially cut through the pastry about a 1/2-inch from the edge. Be careful not to cut through. Spread the bechamel sauce over the pastry. Top with turkey, onions, potatoes, carrots, peas, and mozzarella cheese. Bake for an additional 5 minutes or until cheese is melted. You can broil for an additional few minutes for more browning (be careful not to over-brown or burn pastry). Slice and enjoy! You can substitute turkey with chicken or any type of meat. It can also be meatless/vegetarian by omitting meat and using vegetable broth/stock. Use water or store-bought broth to cook the vegetables if you do not have homemade stock.